A historic milestone could be made on Mars this week. On Thursday, NASA's beleaguered Spiritrover could become the longest-running mission on the surface of Mars,surpassing the Viking 1 lander's record of six years and 116 days of operationon the Martian surface ? if it's still alive, that is. Spirit fell silent on Mars on March 31, when it skipped aplanned communications session with Earth. It may be hibernating through theharsh Martian winter. But even if Spirit doesn't survive, its robotic twinOpportunity is poised to break the Mars mission record in early May. Beating Viking's record, which NASA set in the 1980s, wouldbe a major feat for a rover the size of a golf cart that was only supposed tolast for three months and spent the past year stuck in Martian sand. Themilestone would also be a welcome surprise to the team of scientists andengineers that have been commanding Spirit for these past six years. "Being part of the team that will break the VL1 [VikingLander 1] record will be exciting," said Ray Arvidson of theWashington University in St. Louis, who led the Viking Lander Imaging Team wayback when and now serves as a member of the Spirit science team. "It meansto me personally that I will have participated in two historical events." 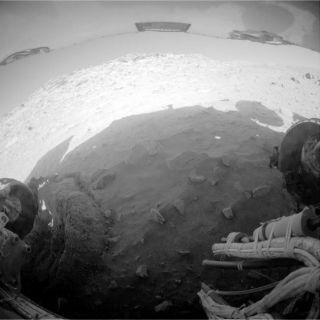 Spirit and its robotic twinsister Opportunity landed on opposite sides of Mars in 2004 ? Spiritbounced onto the surface on Jan. 4, while Opportunity landed a few weeks lateron Jan. 25 Eastern Time. Both rovers were initially slated for just a 90-day missionto explore the geology and chemistry of their respective landing sites. Butthey blew past those deadlines and have continued their missions for far longerthan mission engineers ever thought possible. They passed their six-year marks in January of this year. Thatmeans right now both rovers are in the midst of their seventh Earth year onMars. "By lasting such a long time, the rovers have been ableto accomplish far more science and exploration than we ever expected, andthat's a wonderful thing. We're very proud of that," said Steve Squyres, leadscientist for the Mars Exploration Rover Project at Cornell University inIthaca, NY. The exact hour when Viking ceased operation is debatable,but NASA officials are marking April 29 as the day that Spirit will matchViking 1's record. But NASA's Viking landers (there were two) used a radioisotopethermoelectric generator ? which converts heat from decaying nuclear materialinto electricity ? for power. Spirit and Opportunity use solar arrays that relyon available sunlight and periodic dust storms to keep them clean. Of course, Spirit has been out of communication for the pastfour weeks after entering a low-power hibernation mode once winter sat in andtemperatures dropped along with the sun dipping in the sky, leaving Spirit withlittle available power. Because the rover is out of contact, mission managers maynot know for several weeks whether or not Spirit survived and was still inoperation on its record-setting day, and not before Opportunity matches thesame record. "A communication from Spirit on April 29 or later wouldbe a confirmation that it has matched or exceeded VL1's longevity," saidGuy Webster, a spokesman at NASA's Jet Propulsion Laboratory in Pasadena,Calif. "That might not happen before Opportunity reaches the VL1 longevitymark, which will be on May 20." If Spirit does survive the winter, it will hold the recordover Opportunity, of course. While Arvidson is doubtful that Spirit will break therecord, pointing out how long the rover will have to stay in a low-power mode,Squyres is more optimistic. "You could lose a lot of money betting against thatrover," he told SPACE.com, alluding to the number of times the rover hasimprobably survived tough conditions on the Martian surface. If the Spiritrover does wake up come spring, it will continue to investigate the area inwhich it became mired, checking out new soil targets in the fortuitouslygeologically-interesting spot. How long Spirit, or Opportunity, might hold the longevityrecord is anyone's guess, and will at least hold out until the next Marssurface explorer, the Mars Science Laboratory (aka Curiosity) arrives at thered plant. Curiosity isn't slated to launch until 2011. Even if Curiosity becomes the next rover to match the Viking1 record, it will then have to catch up to whatever new benchmark the MERrovers set as they near their 7th anniversaries, and possibly even make it tolater "birthdays."